(1)NB these seven conditions are inferred by Longview Economics from a reading of Kindleberger’s work: “World Economic Primacy 1500-1990”. Is there any logic to Trump’s actions and, in particular, his recent moves to escalate a trade war with a number of countries across the globe, most importantly with China? Will this address the US’s trade deficit? Are tariffs the cure to the US’s economic imbalances? As we have argued several times in various pieces (e.g. see Longview Letter no 108, March 2017: “Trump, the International Monetary System & the Risk of Global Deflationary Shocks”), one of the main reasons, if not the key reason, for America’s trade deficit is its overconsumption, fuelled by its appetite for debt and the way its financial system is set up to create money and generate leverage in the economy. That coupled with an unanchored international monetary system, that’s $ based (& aided and abetted by BASEL regulations and central bank consumer price inflation targeting) has generated a financial system with an unparalleled ability to create debt(2). This ‘debt system’ has generated demand, over and above supply – hence the trade and current account deficits. In other words, the deficits are not principally a supply side issue but are driven by excessive demand, and, as such, the solution is not an attack on the supply side via tariffs but to address that overconsumption and the US’s savings rate. Once that savings rate is raised to the country’s investment rate, then the deficit (by identity) will disappear. So, on what grounds is there any logic to Trump’s tariff wars? Whilst the diagnosis of the driver of the deficit might be wrong, his actions viewed through the lens of the history appear more logical. Indeed if the models of the rise and fall of Great Powers laid out by Paul Kennedy, Charles Kindleberger and more recently, by Professor Graham Allison with his Thucydides Trap(3) theory, are correct, then Trump’s actions make considerable sense. In other words, it’s the relative economic position that matters (not absolute). That is neatly illustrated by the US’s defence spending which is 3 - 4 times more than China’s current spending. That spending allows it to maintain control over the shipping lanes and key oceans (and contain China within the First and Second Island chains – see Longview Letter no 106, January 2017: “When a Rising Power Challenges the Incumbent” for further analysis). This position, though, is arguably being increasingly challenged by an innovative China, bringing new approaches to warfare, e.g. cyber warfare, and by consistent double-digit growth in defence spending. Third Kindleberger offers the final piece of the historical roadmap, laying out the 7 conditions which bring about the relative economic decline of the leading economic power of the time (NB these conditions are our interpretation and summation of Kindleberger’s thesis from our 2009 research(1)). Those 7 conditions are listed above in table 1 and include: overindebtedness, financialisaton (& deterioration of the manufacturing base), loss of technological leadership, currency debasement and so on. Now while it’s clear that Trump’s administration has not appreciated all of those 7 Kindleberger conditions, it’s clear that they have appreciated and are attempting to address some of them(4). Indeed the loss of US (and western) market share in the global export market (FIG 1) is testament to the rising relative economic strength of China, and relative diminishing strength of the US (& most of the rest of the West). In part that loss of share relates to the competitive cost disadvantage of the US (i.e. more expensive labour costs). Over the long term, though, those relative cost disadvantages should be evened out by the movement in the currency. Hence Navarro and Trump’s contention that China is a currency manipulator (albeit we would argue that, at this present time, the RMB is most probably overvalued, having been previously undervalued for a long period of time). In other ways, though, Trump, Navarro and other members of the administration, would argue that some of the loss of share relates to intellectual property theft and the absence/slowness of the Chinese to open their domestic markets and create a level playing field. It’s in this context, therefore, that Trump’s actions are rooted in the logic of history. By confronting China and attempting to force a level playing field in trade and stop the theft of intellectual property rights, Trump and his team are attempting, on one level(5), to arrest America’s relative economic decline and reverse numbers 4 and 7 of Kindelberger’s conditions and with that potentially reverse the financialisation, overindebtedness and ultimately currency debasement in the US economy(6). If successful, they should delay (or potentially permanently forestall) the dilemma that Allison lays out in his book: That is forestall the ‘Thucydides Trap’ by which a rising power challenges the incumbent global power – and with that forestall the risk of the next major global war. (2)Which happens to be replicated by most other Anglo-Saxon economies, as well as a handful of others, including China. (5 ) Clearly on another level these policies towards China also appeal to Trump’s grass roots political base. (6) In the sense that if the US earns more income through a growing world export share, its need to generate the mirage of income growth (through financialisation and leverage) will be diminished. It’s also worth mentioning that China, itself, has recently experienced a credit boom/period of financialisation and at this stage it’s not clear how this will be resolved without impacting its long term economic trajectory (more specifically there’s a reasonably high risk of a credit bust in coming years. 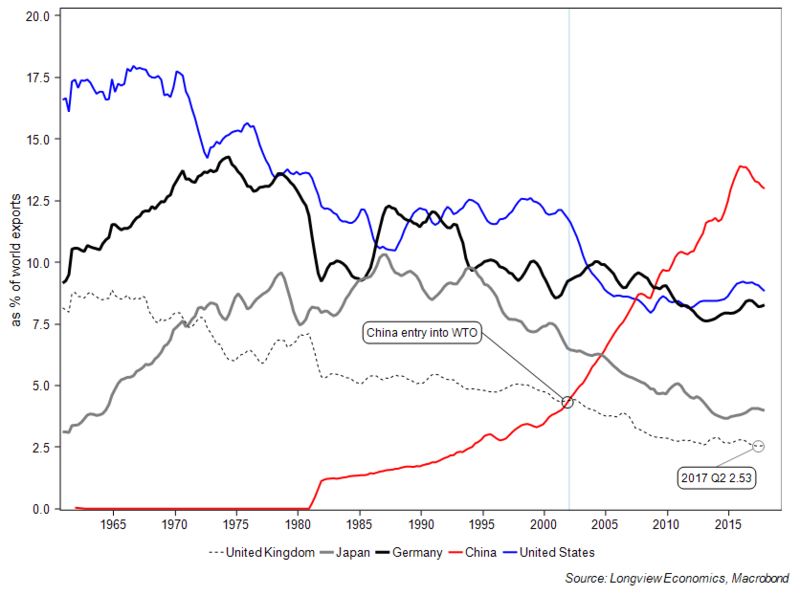 If that occurred, it would set China’s economic progress back considerably relative to the US).